Since the very earliest times of our history our ancestors must have looked at the night sky and wonder what all the points of light were. They observed that every thirty days or so the Moon passed across the sky. They divided the year into units derived from the passage of the Moon which we still call a month (Moonth). Early scientists who were generally astronomers as well as their chosen science, soon realised that some stars appeared to change their position against the background of fixed stars from night to night. These became known as wandering stars or as we known them now, planets. To enable the early astronomers to keep records of the movements of the Moon and Planets they had to draw charts of the sky, recording all the stars they could see with their unaided eyes. On to these charts, the paths taken by the Moon and planets could be plotted from night to night. Early astronomers had no idea of the mechanics of the Universe or even the Solar System. Without the benefit of modern science and the accumulated knowledge of the centuries it is easy to see how it was believed that the Sun, Moon and planets were in orbits around the Earth. The stars were thought to be fixed to the inside of a vast hemisphere covering the Earth. Below is chart by the Greek astronomer Andreas Cellarius drawn in 1660 showing the paths of the Sun, Moon and planets around the Earth. 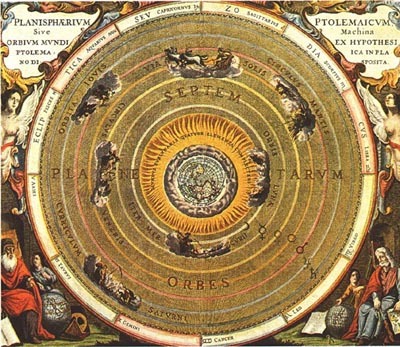 Although this was the accepted view of the Solar system and Universe in the 16th and early 17th century, there were some who disagreed with the theory advocating that the Sun was the centre of the Solar System and the Planets were in orbit around it. One of the first to support this view was Nicolaus Copernicus a Polish astronomer who drew the chart shown opposite in 1543. The establishment which was dominated by the Catholic Church. The Church could not support the Copernican theory because it reduced the importance of Earth as being dwelling place for God's ultimate creation, humans. 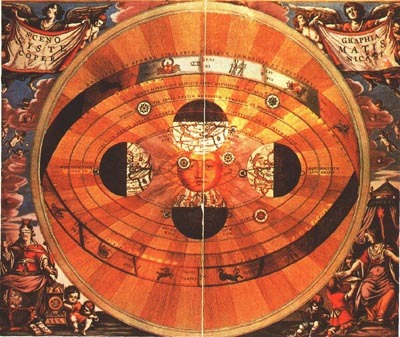 Many supporters of the Copernican theory were persecuted by the church and some were tortured, imprisoned or even put to death for supporting the theory. The great astronomer Bruno was burnt at the stake in 1600 and Galileo was placed under house arrest from 1633 until his death in 1642. CONSTELLATIONS We Humans seem have a need to place things into groups whether it be plants, animals, people or stars. When we look up at the stars we see some appearing brighter than others and we have a tendency to make familiar shapes out of the star patterns in our mind rather like seeing the shapes of rabbits or elephants in the clouds. Many of the patterns seen in the stars were recorded in ancient times are still used today. We call these recognised patterns 'constellations'. Constellations are groups of stars that appear to make up a recognisable pattern. The stars are not normally associated with each other and just located in the same area of sky. Some patterns do look remotely like what they are named after which is normally a character from mythology. Most constellations however need an awful lot of imagination to relate the pattern of stars to the figure of mythology. The ancient Greeks recognised 48 constellations including the 12 constellations of the Zodiac. These constellations are those that the Sun Moon and planets pass through over the course of a year. An imaginary line drawn through these constellations and following the path taken by the Sun is known as the Ecliptic. Because of the tilt of the Earth the ecliptic is tilted at about 23° to the Earth's equator (Celestial Equator). Until the 1930's there was no standard list of constellations then the International Astronomical Union, astronomy's governing body, adopted the list of the 88 constellations we use today. Constellations remain as the accepted system of identifying the various parts of the night sky. Most of the star patterns of the constellations are easily recognisable even if they do not resemble what they are named after. Alternative methods using co-ordinates may be more accurate but it would be much harder to define the borders of areas with the naked eye when recognised patters straddle the borders. Stars are allocated an identification within the constellation in which they are located, using a letter from the Greek alphabet. If there are not enough letters then identification continues using numbers. An example would be a (alpha) Orion, the Latin form of the constellation name is usually used so we call this star a Orionis. Many of the brighter stars also have real names so a Orionis is also called Betelgeuse. Old star charts were often beautifully drawn and decorated with pictures of the mythological figures representing the constellations and are now regarded as valuable works of art. Although these magnificent charts were wonderful to look at each artist depicted the figures using his own interpretation of what the mythological figures should look like. As a consequence. no two charts looked alike. Before the invention of the telescope this was not a problem because there is only a limited number of stars to be seen with the naked eye so they could be plotted on the chart and the figure overlaid. 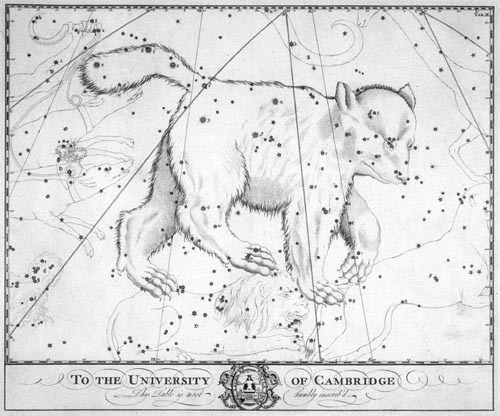 With the introduction of the telescope more accurate star charts were needed so the beautifully illustrated charts began to disappear and were replaced by the more scientific charts we see today. The method of defining the position of a star used today is a co-ordinate system using Right Ascension and declination. Right Ascension (RA) is measured in hours, minutes and seconds around the Earth's equator from a set point known as the Vernal (or Spring) Equinox. This is the point where the Ecliptic crosses the Celestial Equator when the Sun appears to be moving northwards in spring. This point was also known as 'The First Point of Aries'. This point in the sky was at one time in the constellation of Aries (The Ram) but due to a process called 'Precession' (the wobbling of Earth on its axis every 26,000 years) has now moved into the neighbouring constellation of Pisces (The Fishes). Declination is the measure of degrees from the Celestial Equator to the poles +90° to the north and -90° to the south. Therefore the position of a star might be written as RA 12hr 13min 26.3 sec, Decl +25 deg 20min 10.5 sec. The advantage of co-ordinate system is that the position of the star can be defined very accurately. The disadvantage is that it is not so easy to say where that star actually is in the familiar sky which we still associate with areas defined by the constellations. There are many modern star charts but one of the most widely used is Norton's Star Atlas. Norton's is a book of 14 charts with an accompanying lists of objects of interest. The charts are laid out with one chart for each month of the year and two showing the polar regions. The Atlas also has very useful tables, lists and information covering most astronomical topics. Modern technology has enabled very detailed charts to be produced using photographs. One of the most widely used is the Palomar sky chart produced from thousands of photos taken by the Schmidt camera at Mount Palomar USA. This chart identifies millions of stars and is used widely by professional astronomers to guide the greatest telescopes in the world.. Probably the biggest advance in very detailed charts for the amateur astronomer, is the availability and technical progress of the personal computer. Very sophisticated charts are available at a modest cost. These computer programmes are not only charts but are also active planetarium applications. This means that the sky can be displayed showing the positions of the Sun, Moon, planets and thousands of stars. The positions of thousands of deep space objects such as galaxies, star clusters and nebulae can also be plotted. By changing the time in the application it is possible to view the sky at any time in the past or the future 40,000 years and from any vantage point. One of the most popular star chart applications is Redshift 4. This latest version of Redshift is supplied on two CD's and retails for about £20. One of the amazing features of this type of package is that the positions of objects can be displayed in real time. This means, if a planet, say Jupiter, is zoomed in on, the moons and cloud bands are in the correct position. If you are using a telescope at the same time, it will be able to show which moon is which or where the Great Red Spot is at any time. The charts included in the magazine and on this website were produced using an application called Starry Night. This is a rather more expensive package than Redshift, at about £100. This package will allow the charts to be viewed or printed as real sky views as shown on page 5 or as a true chart as shown on pages 1 and 6. Many of these more expensive packages are capable of being used to supply information directly to a telescope. Drive motors can then position the telescope on to the co-ordinates for the object to be observed. Whichever application is used they are all great fun and contain huge amounts of information for the new or experienced astronomer.